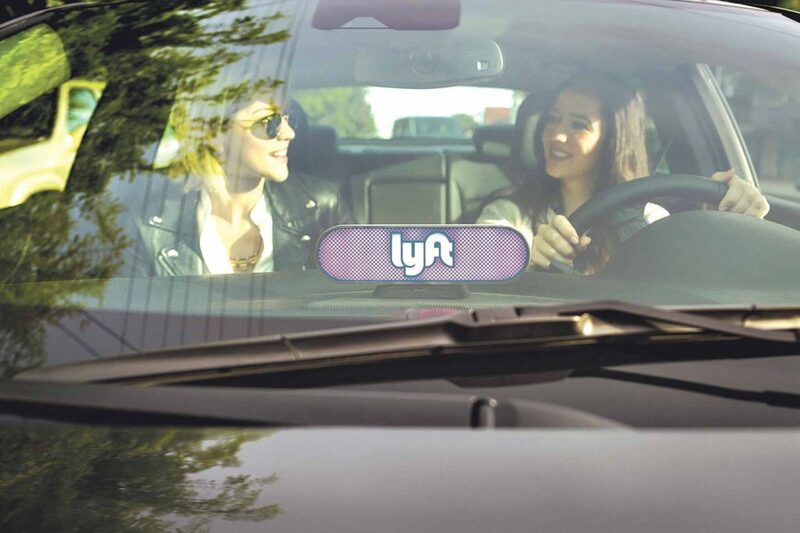 Lyft cars are identified with a light-up sign on the dashboard. Getting a ride on Long Island will soon be as easy as a few taps on your smartphone. The recently passed New York State budget allows the expansion of ride sharing services such as Uber and Lyft into upstate and Long Island, a move that is expected to help the area economically as well as help cut down on DUIs. While Uber and on a smaller scale, Lyft, have enjoyed popularity in New York City, up until the approval of the budget in April, the ride sharing services were banned on Long Island. Whether or not these services make their way to Glen Cove is up to Nassau County, which has the choice to opt-out. Either way, regulation will fall under the authority of the Department of Motor Vehicles (DMV). A spokesperson from Nassau County said the legislation is currently being reviewed by the county’s Taxi and Limousine Commission. The DMV is tasked with creating regulations that govern the operation of ride sharing companies, formerly known as transportation network companies (TNC); regulations are expected to include the background check process, vehicle inspection and reporting requirements. The state has a 90-day window before ride sharing services can roll out to Long Island, but the tentative July 9 date also depends on the DMV finalizing their rules. While your parents may have warned you never to get into a car with strangers, ride sharing seems to be the way of the future. Ride sharing companies such as Uber and Lyft provide taxi-like services by connecting passengers to drivers via a smart phone app. Rides can be arranged in advance or on short notice with pick-ups based on current location or at a specific address. Fares vary depending on distance and type of ride (SUVs, sedans or carpooling are all options). The new law passed as part of the state budget requires potential drivers to obtain a TNC driver permit and undergo background checks. Ensuring background checks are thorough has been a major point of emphasis, and in a letter to the Nassau and Suffolk county executives, Committee for Taxi Safety president David Beier urged that the same regulations apply to TNC drivers as the ones that currently govern taxis, saying that the ones Uber and Lyft currently had in place were not stringent enough. According to Lyft’s website, drivers whose background checks reveal a violent crime, felony, drug-related offense, sexual offense or certain theft and property damage offenses, are ineligible to drive. Uber has a similar process in place. Josh Gold, policy director at Uber, said the state legislation includes drivers going through annual checks of local, state and national criminal databases. Uber is also notified anytime one of their drivers gets a speeding ticket, DUI or any other event that involves their license. Once they hit a certain level of incidences, they can no longer be an active driver. Durbin said Lyft is actively recruiting drivers through their website and that the number of apps downloaded in each community will determine where the demand is highest. Gold said Uber has already seen a high demand for the service on Long Island. “We’ve seen thousands of driver and rider sign-ups. We know the demand and desire is there,” Gold said. Gold noted that the LIRR and NICE bus system do a good job covering routes going west to east, but believes that Uber will be a huge help for passengers looking to go north to south. Uber can also help alleviate some of the congestion in train station parking lots, Gold said. “The LIRR parking lots are overflowing. We see ourselves as a way to replace that second family car that is used just to drive to the train station and is just sitting in the lot all day. We want to replace that car with ridesharing,” said Gold, saying that model is already being followed in places like New Jersey and Connecticut. Durbin added that when ride sharing is introduced to communities, there are numerous economic benefits, both for drivers and passengers. He cited a recent third party study that showed that nationally, Lyft generated $750 million in increased economic activity and that last year, Lyft drivers earned $1.5 billion. Ride sharing also cuts down the number of DUI incidences, Durbin said, offering communities a tremendous health and safety benefit. With Long Island residents always looking for a reliable way to get around, ride sharing seems to be a welcome addition to the community. What it will mean for taxi drivers however, remains to be seen. Betsy Abraham is the managing editor of The Westbury Times and Mineola American and a writer for Long Island Weekly.